The system backup function allows you to backup and restore the settings and configuration of your network drive. Backup Click Backup to save your current settings in a ZIP file that you can store on your computer. Upload Click Upload and select a previous backup file (ZIP file) in order to restore the settings to the previous state. 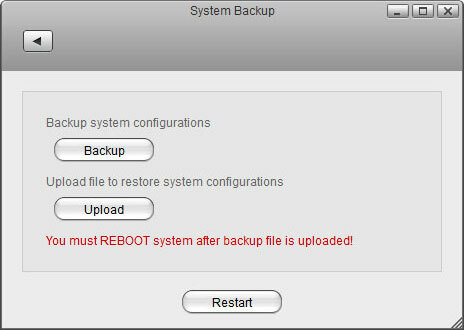 You must reboot the system after uploading an old backup (ZIP file) in order to completely restore the settings.